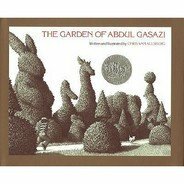 Abdul Gasazi Review: Chris Van Allsburg's first picture book, created way back in 1979, is the Caldecott honor book, The Garden of Abdul Gasazi. This is a difficult story to adequately explain, or do justice to. It's akin to attempting to explain a subtle but brilliant illusion from a live magic show to people who were not present to view it. Alan then takes the unruly canine for a walk in the country. He crosses a bridge and comes across a strongly written sign in bold letters, 'ABSOLUTELY, POSITIVELY NO DOGS ALLOWED IN THIS GARDEN.' The sign stands at the entrance to the garden of legendary retired magician, Abdul Gasazi. Fritz, being the little ratbag he is, nonchalantly scampers through the open doorway to the garden's interior. From that point on, the reader turns each page expecting at any moment for some curious fate to afflict Alan or for him to be witness to some unnatural or otherworldly event. Does something magical actually take place? Each reader will have a different interpretation of the strange events in this surreal story. The illustration are done in glorious black and white, with just pencil it seems. The pictures are full of light and shadow and finished with a supreme skill. Chris Van Allsburg's drawings remind me of a quote from the film Amadeus, where Mozart's arch nemesis and secretly devoted fan, Salieri, describes Mozart's music as being 'finished like no music is ever finished.' 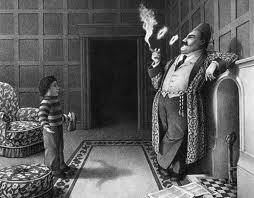 Van Allsburg's drawings have that same sense of singular completeness. There is always a sense of unease and an almost hyper-real feeling about each sumptuous image. Be it the towering presence of Abdul Gasazi's stately house and gardens, or the quiet menace of the man himself, each immaculate drawing has Van Allsburg's signature use of detail. Do yourself a favour and buy or borrow a copy of The Garden of Abdul Gasazi. Highly recommended.